A recent update to the Android Gmail app, version 6.0, brought with it a much needed feature. 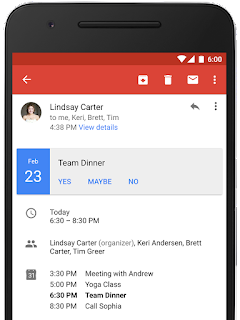 Now, in a similar fashion on the web interface, calendar invites (.ics files) will be parsed out and displayed to users so you can respond without even leaving Gmail. No real instructions need to be provided as you can simply just tap on Yes, Maybe, or No to respond as you would on the browser interface.